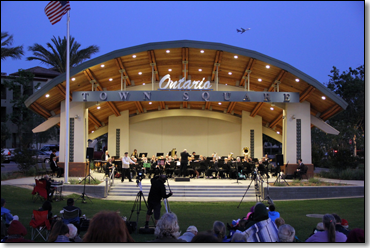 The Ontario/Chaffey Community Show Band is proud to present “The Music of Henry Mancini” on Monday May 14th at 7:30 p.m. in Merton Hill Auditorium located at the corner of 5th Street and Euclid Ave on the campus of Chaffey High School in Ontario. Early birds are invited to come at 7:00 p.m. to enjoy complimentary cookies and Starbucks coffee and listen to the “Woodwind Celebration” in the lobby of the auditorium. Admission to the concert is FREE. Henry Mancini was an American composer, conductor and arranger, who is best remembered for his memorable film and television scores. Often cited as one of the greatest composers in the history of film, he won four Academy Awards, a Golden Globe, and twenty Grammy Awards, plus a posthumous Grammy Lifetime Achievement Award in 1995. His best known works include the theme to The Pink Panther film series , “Moon River” from Breakfast at Tiffany’s, and the theme to the Peter Gunn television series. The Peter Gunn theme won the first Grammy Award for Album of the Year. The Ontario Chaffey Community Show Band was founded in 1985 by R. Jack Mercer and is now under the direction of Dr. Gabe Petrocelli with assistant directors David Schaafsma and Pat Arnold. Band members represent at least two dozen communities throughout Southern California. Adult and student musicians are invited to participate. No auditions! Rehearsals are held on Monday evenings from 7 to 9:00 p.m. at the Chaffey High School Jack Mercer Band Room. The band performs monthly concerts in the historic Gardiner W. Spring Auditorium and at other venues throughout the community. All performances are free to the public.